The new H.265 draft specifically addresses mobile devices and networks overloaded with video. Products using the new H.265 video compression standard could begin to launch as early as next year. Apple is likely to quickly adopt support for the new H.265 specification, just as it has rapidly rolled out support for new features of H.264, including support for expanded H.264 profiles in the new third generation Apple TV and the New iPad. MPEG, formed by the International Standards Organization in 1988, first developed a joint video compression format in 1993 intended for Video CD. Its video codec, H.261, was used to deliver multimedia video clips. The audio portion of that standard, MPEG-1 Audio Layer III (also known as MP3) revolutionized the portability of music by allowing users to rip CDs to files that could be compressed enough to be used in mobile devices with limited storage. Apple backed MP3 with the iPod in 2001 at a time when Microsoft and Sony were working to entrench their own proprietary standards with strong DRM (Windows Media and ATRAC, respectively). MPEG released the MPEG-2 standard in 1994, which enabled high quality DVD and efficient digital TV transmissions. MPEG-2 incorporated the initial H.261 video compression standard as well as a more efficient H.262 and, later, the H.263 ASP codec implemented by DivX and Xvid, popular formats used for video file sharing. Work on an MPEG-3 standard aimed at HDTV was abandoned and folded into the MPEG-2 portfolio. MPEG-4, initiated in 1998 and released in 2003, merged the television and video industry's expertise with work pioneered by Apple's QuickTime on desktop computers, resulting in a video format that incorporated Apple's QuickTime container format. This helped to simplify video editing tasks, even as Apple began adopting advanced bidirectional compression technologies in QuickTime that had been contributed to the MPEG-4 pool by the rest of the industry. MPEG-4 carried forward H.263, which Apple hadn't ever widely used, while also introducing H.264, which enabled a doubling of video quality at the same size as the earlier H.263 codec. Before MPEG-4, Apple had previously used proprietary video codecs from Sorenson in QuickTime, but rapidly began adopting MPEG standards as the pooled efforts of every major company with video expertise began to quickly outpace the development of alternatives. Apple helped to popularize MPEG-4's AAC (Advanced Audio Codec) format as a more efficient replacement for MP3 in iTunes, then brought MPEG-4's H.264 video compression into the desktop computing mainstream as the default video codec in QuickTime. It is now essentially the only video standard supported by the iPhone and other iOS devices, and H.264 is deeply integrated into the architecture of QuickTime. 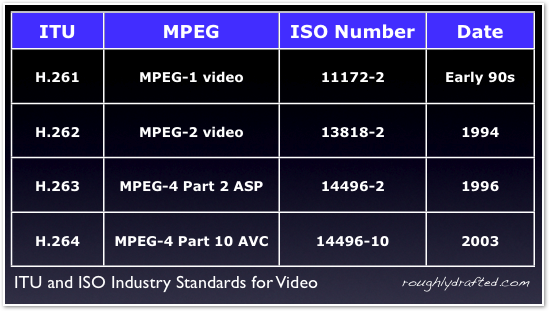 While MPEG itself usually refers to its MPEG-4 audio and video standards as AAC and AVC, Steve Jobs introduced the new video standard to the world as H.264, and Apple continued to refer to it by its ITU numerical designation. MPEG is now referring to its newest H.265 standard as "HEVC" (High Efficiency Video Coding). In 2009, a consortium of web browser vendors led by Mozilla and Opera began to oppose MPEG's H.264 for use on the web to deliver video after Apple, Nokia and Microsoft recommended it as an alternative to plugin based video delivery (typically Adobe Flash) in the emerging HTML5 specification. Mozilla recommended the open source Ogg Theora instead, despite the format's inability to play back efficiently on mobile devices (which all have H.264 hardware compression, but rarely support anything else) and its much lower technical sophistication compared to H.264. Google joined the fight in in 2010 after acquiring the proprietary VP8 codec and releasing it as WebM, a free, open alternative to H.264, albeit without any certification of protection from future patent claims. Google insisted that the patent licensing required by H.264 made it incompatible with the open nature of the web, but the WebM alternative it offered was immediately accused of infringing the patents H.264 incorporates. Google subsequently acquired Motorola Mobility, gaining ownership of several patents essential to H.264. It has used these patents to seek import injunctions and demand billions in licensing royalties from Microsoft and Apple as leverage against patent infringement claims targeting Android.